The box in which it came is huge. A grown adult can easily fit there and play jokes or scare people. Kids will love it. lol. Any hoo, this hp laserjet 500 is a little heavy. If you have a bad back or are not very strong I recommend you move it with the help of some one. Make sure you put this printer in a very sturdy table or desk. Out of the box the printer has all of it's toners (both black and color) pre-installed and ready to go. All you have to do is remove the security tapes and you're done preparing the hardware. Installing paper is also very easy. Everything feels robust and looks like it will last very long. 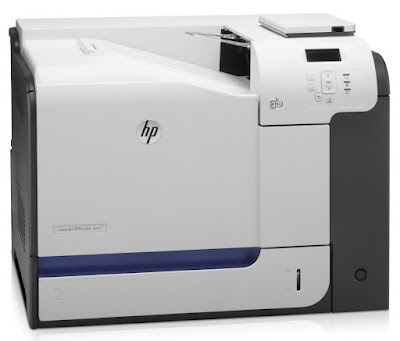 When you first turn it on, the hp laserjet enterprise 500 color m551dn goes trough a series of tests and boot sequences. It takes a couple of minutes for this. Actually, the boot up is pretty slow even after. Takes about 1.5 minutes to boot each time. Shutting down is fast though. Installing the software was not hard. It did not detect the printer at first try. By default, the printer was not using DHCP and had a static IP. After a couple of minutes of messing with the LCD menu I was able to find the option and change the network settings. Not big of a deal. I was quickly able to assign a relevant IP address to it. Some one with out any networking experience might fumble a bit with this. After changing the IP, i could ping the printer and the software finally detected the printer. The remaining installation of the software was very easy. A test page was printed successfully at first try. After it's first print I noticed a buzzing noise coming out of my PC speakers. After doing some investigating, the culprit was the printer itself. Whenever it's in active mode, the printer makes a buzzing noise that you can hear if you get close to the printer. This noise is introduced to your electrical grid somehow and you can hear it very noticeably in your computer speakers. Two computers in different rooms experienced this issue. Maybe a voltage regulator might help. I have to try that out. And then printed a color photo image about half a letter page in size with various colors. The printout was good but it did not wow me. I raised the resolution and it didn't make much difference. The color accuracy was not spot on. But this may be due to paper quality, image quality, monitor calibration or simply user printer configuration. I have only printed about a dozen pages in color so take this info with a grain of salt. As for the real heavy usage, after three months of black or white printing, we have not a had single page get stuck or damaged when printing. No paper jams at all. Everything has been perfect in that regard. No problems and no complaints can be made by me. Only issue was an error appeared on screen. The printer was left on and the next day it had en error message. It made no sense and I couldn't see what it meant on the manual. I just reseted the printer and all was good again. 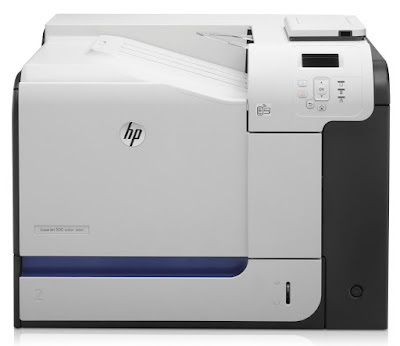 The hp laserjet enterprise 500 color printer m551dn also has a web portal you can easily access by simply typing in the printer's IP address. Here you can change the printer's configuration in a very user friendly web page. It's very easy to restrict color printing here. This m551dn model also supports HP eprint which allows you to print emails or attachments directly through your cell phone. Just send an email to the printer's email address (you can assign it through HP eprint sign up webpage) and the information is printed. In general, this printer is great for high capacity black or color printing. It's fast and reliable. The only reason for the 4 stars instead of 5 is because of the on/off buzzing noise it makes and introduces this to the electrical grid. Also, the slow boot is a bit annoying. Here's of pros and cons for this printer.